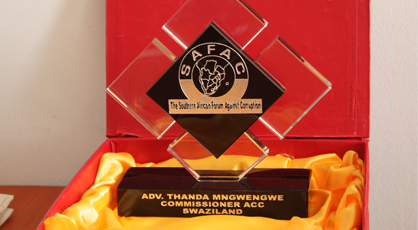 The Anti-Corruption Commissioner recently received a regional Award from the Southern African Forum against Corruption in recognition of this contribution towards the fight against corruption in the region. The Commissioner, after receiving the ward, thanked SAFAC for the recognition and thanked members of staff as he believes the award belongs to them. He also committed to working diligently for the people of Swaziland in fighting corruption without fear or favour. LAUNCH OF NATIONAL CORRUPTION PERCEPTION SURVEY REMARKS BY HON. MINISTER FOR JUSTICE AND CONSTITUTIONAL AFFAIRS, SENATOR EDGAR HILLARY. RR REMARKS CORRUPTION PERCEPTION SURVEY. 3rd Floor Mbandzeni House, Libandla Street. Manzini Regional Office, Du Toit Street Next to Alcon House. Designed by Real Image Internet.